Time to grab a box of tissues and happy-cry, because the world just became a slightly better place thanks to one man’s subway trip. In the unlikely event that you don’t use social media, Instagram is an amazing way to share moments from your life with both friends and strangers, and NPR is taking advantage of its storytelling capabilities with a program called Public Square. Each month there is a different hashtag and theme, and in October they asked followers to share photos from their commute. 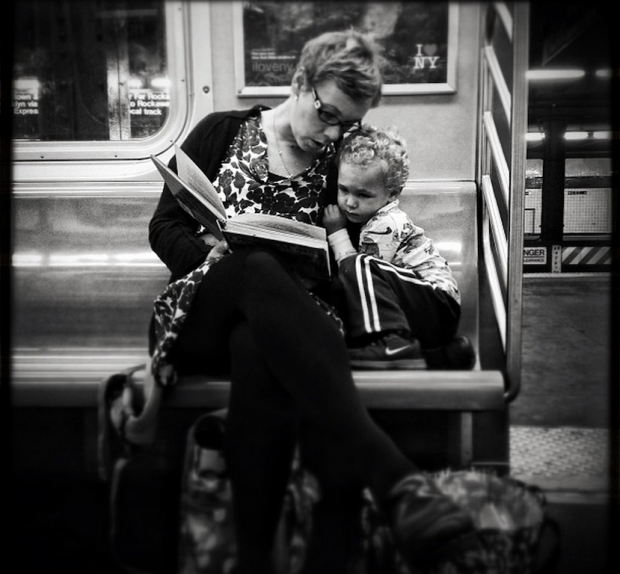 Which brings us to amanteur photographer Jabali Sawicki, who posted a photo on Instagram of a mom reading to her son on the subway going from Penn Station to Brooklyn. The child is curled up next to his mother as she reads out loud to him, and Jabali was blown away by the moment shared between them. Annnnd, tears. It’s amazing that Megan found the image, but even more amazing is the photo itself — which illuminates the special bond between a mother and her child amidst the chaotic background of the subway. Also, let’s be honest, it’s a breath of fresh air to see a kid turning paper pages — not zoning out in front of an iPad.